Pharmacy technicians support registered pharmacists with the distribution of medication and health care products to patients. Pharmacy technician programs prepare adults to meet the rising for technicians in hospital and institutional pharmacies. Pharmacy technicians are a vital part of the health care industry. As they take on an expanded role and increased responsibility, certification has become even more critical, especially for employers. Georgia pharmacy technician programs are available in community colleges, vocational schools, and propriety schools. Those that are accredited by the American Society of Health-System Pharmacists will include theory as well as clinical experiences in both community and institutional pharmacies. Students gain the skills and have a broad knowledge that is required to interpret prescriptions, order and store products, prepare medications, package and label prescriptions, and bill insurance companies and collect payments. 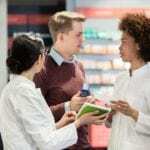 Pharmacy technicians perform much of the same duties as a pharmacist, but the pharmacist must check the medication before it can be dispensed to the patient. Wiregrass Georgia Technical College’s Pharmacy Technology program leads to a Pharmacy Technology degree. Students acquire the skills to function as entry-level employees in a retail or hospital-based pharmacy department. Through lectures, demonstrations, and clinical rotations in real-world pharmacies, students will develop professional knowledge, academics, and competencies required to the acquisition and retention of pharmacy technician employment where they will distribute medication under the supervision of a licensed pharmacist. Students must complete the prerequisite courses before commencing the occupation courses. General core courses include language arts/communication, composition and rhetoric, quantitative skills and reasoning, mathematics modeling, college algebra, and three 3 hours each of humanities/fine arts and general education core. Occupational courses include anatomy and physiology, medical terminology for allied health sciences, pharmaceutical calculations, pharmacy technology fundamentals, principles of dispensing medications, principles of sterile medication preparation, pharmacology, advanced pharmacy technician principles, and pharmacy technician practicum. Additional courses include college and career success skills and introduction to technology and computer application. Graduates of the ASHP accredited program will be eligible to sit a national certification exam provided that all the other requirements are met. The school begins a new cohort every other semester. The duration of the program is 70 weeks. Tuition for the program is $5,917. Books and supplies cost an additional $1,126. The program qualifies for HOPE Career Grant. Through the online pharmacy technology program, the Regional Center for Continuing Education at Valdosta State University equips students with the skills needed to become a pharmacy technician and qualify for entry-level positions in retail and institutional pharmacies. Students will be paired with an instructor for one-on-one assistance. Upon completion of the theory, they may qualify for a 40 to 100-hour externship to practice the skills gained in a real-world setting. Graduates will be prepared for success on the PTCE national certification exam. Students will learn the laws that govern pharmacy practice, HIPAA requirements and their application in practice, pharmaceutical terms and common abbreviations, and the pharmacology of medications as it relates to anatomy. They will also learn how to read and interpret physician orders and prescriptions, prepare and distribute medications, communicate with members of the pharmacy team and other healthcare professionals, process insurance billing and collect payments, and perform pharmacy calculations. Students must complete a Virtual Externship as part of the training. Course topics include foundation and roles, advanced pharmacy environments, hospital pharmacy, community pharmacy, pharmacy law and ethics, pharmaceutical calculations, intravenous flow rates, parenteral doses, pharmacology basics and specific populations, body systems, communication, billing and collections, inventory control, lab practice, and pharmacy externship. The self-paced program must be completed in 12 months. Tuition costs $2,495 and includes all materials and registration fee. Albany Technical College offers a pharmacy technician diploma or degree program. Both programs provide students with the skills for entry-level employment in a retail or institutional pharmacy. Graduates will have the knowledge and competencies to prepare and dispense medications in accordance with the standards and procedures required by law and under the supervision of a registered pharmacist. Evening classes are available for both options. The diploma option requires completion of 54 credit hours. The degree program is 63 credit hours. Occupational courses include structure and function of the human body, introduction to health care, allied health sciences, introduction to computers, pharmaceutical calculations, pharmacy technology fundamentals, pharmacology, principles of dispensing medications, principles of sterile medical preparation, pharmacy technology practicum, and advanced pharmacy principles. Tuition for the program costs $6,136. Books and supplies include $1,600.